When we announced that Star Wars™: The Old Republic™ was available for Pre-Order, we also told you about the many digital items that come as a bonus for purchasing the game. While there is a pre-order bonus for everyone who secures their copy of the game regardless of the edition pre-ordered, some of these digital items are reserved for those of you who purchase either the Digital Deluxe Edition or Collector’s Edition of the game. To add clarity, we’ve decided to break down the digital items that you will be able to gain access to in each edition of Star Wars: The Old Republic. Color Stone. Included as part of every pre-order of Star Wars: The Old Republic, the Color Stone is a special crystal that players can use to change the color of any lightsaber blade or blaster bolt to a yellow hue encased in a black outer shell. This item will be unlocked and tied to your account when you register your pre-order code on the StarWarsTheOldRepublic.com Code Redemption Center. These items are included as bonuses for the Digital Deluxe Edition. Flare Gun. The Flare Gun is a small cosmetic device that allows you to fire a particle flare high into the sky above your character’s head. Training Droid. A small but advanced piece of machinery, the Training Droid will hover by your side as you explore the galaxy. The Training Droid will also serve you in combat, marking your target with a particle effect that clearly identifies them as an enemy. HoloDancer. The HoloDancer allows you to take the party with you in your travels and can be deployed at almost any time by activating the HoloDancer and targeting the ground near your character. HoloCam. The HoloCam lets your character take high-resolution images of the countless wonders that they will discover on their journey across the galaxy. STAP. The STAP, or Single Trooper Aerial Platform, is a custom-skinned vehicle that you will be able to acquire at no cost to you. The vehicle itself will become available once your character gains the ability to pilot vehicles. Once you redeem your Digital Deluxe Game Code on the www.StarWarsTheOldRepublic.com Code Redemption Center, these items will be unlocked on your account and will be available to any character you make. 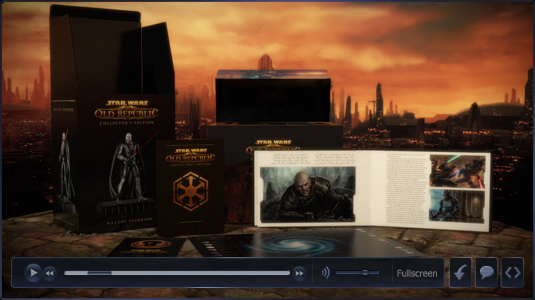 In addition to the items included in the Digital Deluxe Edition, the Collector’s Edition of Star Wars: The Old Republic includes the following items. Mouse Droid. This mouse droid, custom-skinned for Collector’s Edition owners, serves as a faithful pet that will follow you as you make your way across the galaxy. Collector’s Edition Store. At launch the Collector’s Edition Store will be available to those who have the Collector’s Edition of The Old Republic, and will feature items found nowhere else in the game! The Collector’s Edition will be stocked with exclusive social items for yourself, and unique appearances for your companion. The store will also have regular updates to give players incentive to keep coming back. These items will be unlocked for you when you redeem your game code on the www.StarWarsTheOldRepublic.com Code Redemption Center. Once unlocked, you will be able to access them with any character you create on that account. Of course the only way for you to have access to these items at launch is to pre-order the game for yourself, so be sure to visit our Pre-Order page and secure your spot in The Old Republic now!